ARCHIVE BLOG NOTE: Find something interesting in the archive? E-mail a short write-up to archive@jta.org and you could be published in the JTA Archive Blog. You know your uncle, the one always telling you about Jewish Nobel Prize winners? Well he’s kvelling this week, what with four Jewish scientists winning the Nobel Prize in chemistry, physics and medicine. Deep in the JTA Archive, however, not everyone was always so excited about Jewish Nobel Laureates. Professor Philipp Eduard Anton von Lenard, pictured above, won the 1905 Nobel Prize in physics for his work on cathode rays. In February 1923, JTA reported that "P. Leonard" protested the 1921 Prize awarded to Albert Einstein — a.k.a. 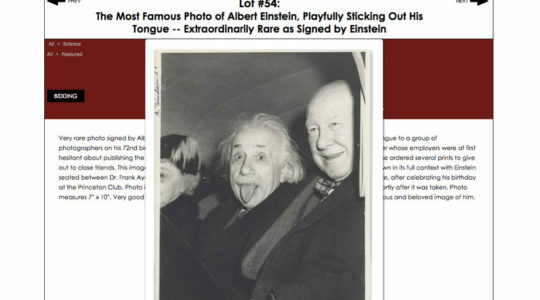 Albert Freakin’ Einstein — whom he accused of possessing "insufficient German spirit." (It’s possible that Lenard was operating under the misconception that Einstein had been awarded the Nobel Prize in German spirit.) At the time, Einstein was unable to comment because he was in Palestine “in connection with the preparation of plans for the Hebrew University in Jerusalem." Our archive provides some schadenfreude: Leonard was forced to resign from the University of Heidleberg because he refused to suspend his classes during the funeral of Dr. Walter Rathenau, the former German foreign minister murdered in an anti-Semitic assassination on June 24, 1922. Leonard would later go on to become a prominent proponent of "Aryan Physics" in the Third Reich.